Earliar this week the baseball world got the sad news that Virgil Trucks had passed away. Virgil Trucks, a star of the 1940s and 50s, was not a Hall of Famer but is noteworthy throughout the hobby largely because he was known as an enthusiastic TTM(Through the Mail) signer of autographs. I have never gone delved into the TTM area of collecting and cannot really speak to its signficance. Fortunately the terrrific blog Foul Bunt covers both TTM and Virgil Trucks and put together this farewell posting for Mr Trucks. Nice praise from a member of the current generation of players, who gets how important the fans are to his profession. Neshak also noted that he once wrote to Trucks for pitching related advice - Trucks returned a four page letter filled top to bottom. Virgil Trucks won 177 games and would have likely won more had he not spent two of the early years of his career in the service. 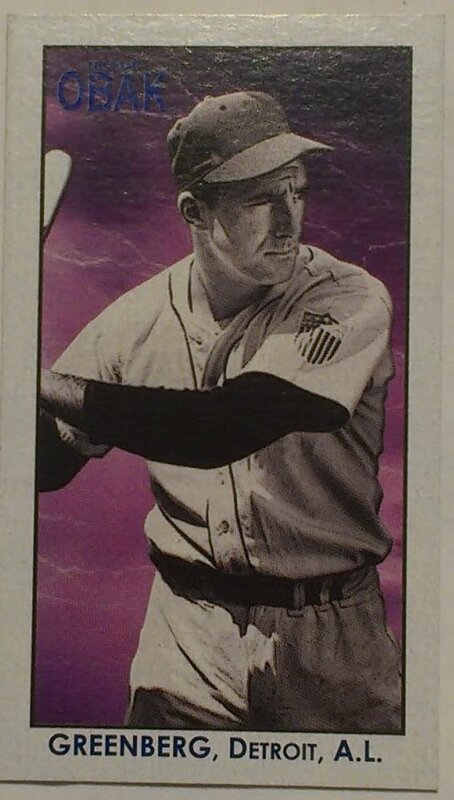 He was a member of the 1945 World Champion Detroit Tigers and made a pair of All-Star teams. 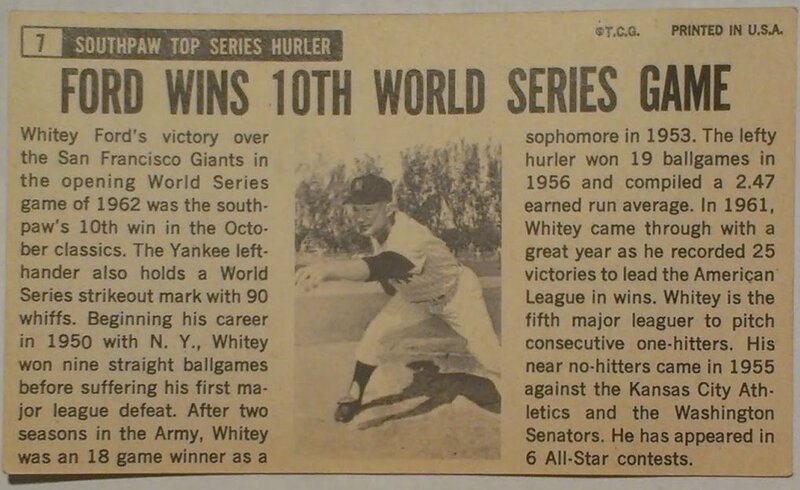 In 1952 Trucks threw 2 no-hitters - both games were won by a score of 1-0. For more in depth analysis of Virgil Trucks career check John Autin's column at High Heat Stats. the 1953 Topps card is a bit of an anomaly in the catalog of Virgil Trucks cards, he only played one season for the Browns and it was the last season ever for the team. In 1954 they moved to Baltimore and became the Orioles. I am not sure what this beauty went for, but yes it is in loved condition and quite a bit off center. Still Virgil Trucks is a star and I also consider the rare St Louis Brown card a bonus. 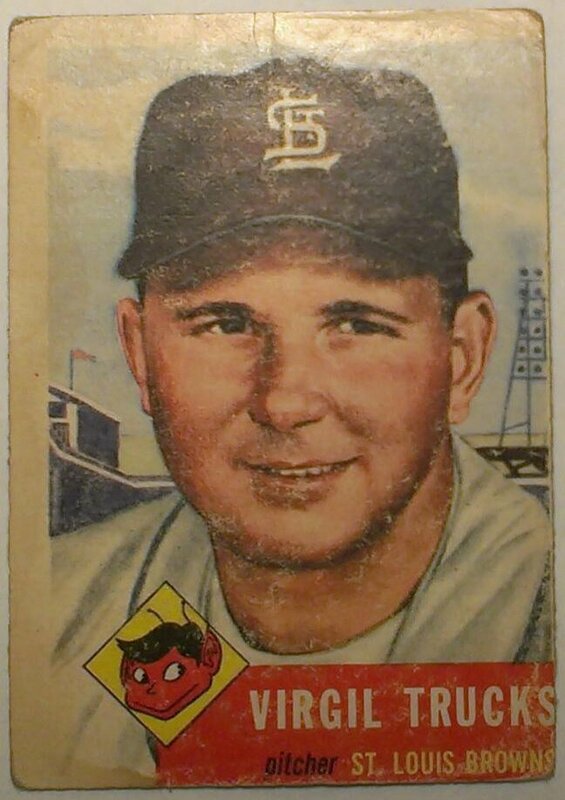 For 1953 Topps cards in the low series in questionable condition I typically look for a price point of $2, add a dollar premium for it being a St Louis Brown and another dollar or two for Mr Trucks being a star and a gentleman - I could see this card being found for $4 - $5. Indeed the recent low eBay sale for a 1953 Topps Virgil Trucks in signficantly better condition then the one above was $2.61. On the other end of the scale a graded (PSA EX-MT 6) card went for $29.24. Even though his career ended long before I was born, it is important that we remember people like Virgil Trucks. MLB and all of sports could use more alums that remember that the most important element of sports and entertainment is the fans. One final fun note I found, Virgil Trucks is related to musician Derek Trucks - The Derek Trucks Band and Susan Tedeschi have been on my radar as bands to see for a while, but really haven't made it to any of their shows at least partially due to being so obsessed with baseball. Lionel Simmons was the leader of the 1989-90 LaSalle Explorers who finished with a record of 30-2. Simmons was named the 1990 Naismith college player of the year and also took home the John R Wooden Award. His 3217 career points in the NCAA ranked him behind only Pete Maravich and Freeman Williams when he graduated. Simmons went on to play seven years with the Sacremento Kings. He was named to the 1990-91 All-rookie team in his first year which was probably his best (18 ppg, 8.8 boards). In 1997 retired due to chronic injuries. Simmons is also a member of the Philadelphia Big 5 Hall of Fame. 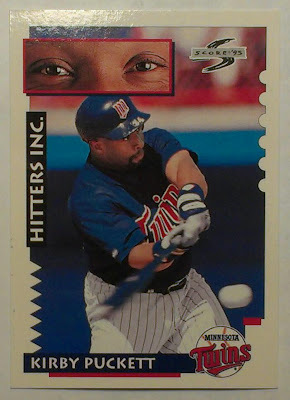 Andy from HighHeatStats noted this AM via twitter that today is the anniversary of the day in 1996 when Kirby Puckett woke up without sight in his right eye. He was diagnosed with glaucoma. His career as a Major League Baseball player was over. This card as always freaked me out. 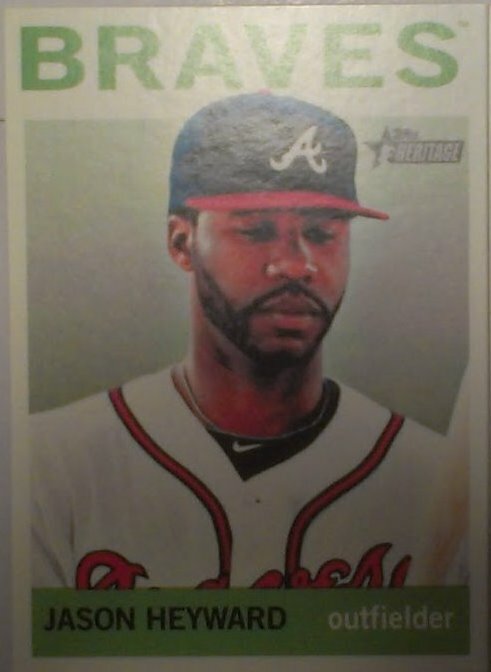 I mean how many cards go so out of the way to feature a players eyes? And those are the eyes that betrayed Kirby Puckett and basically ended his Hall of Fame career. Freaks me out when I think about it. 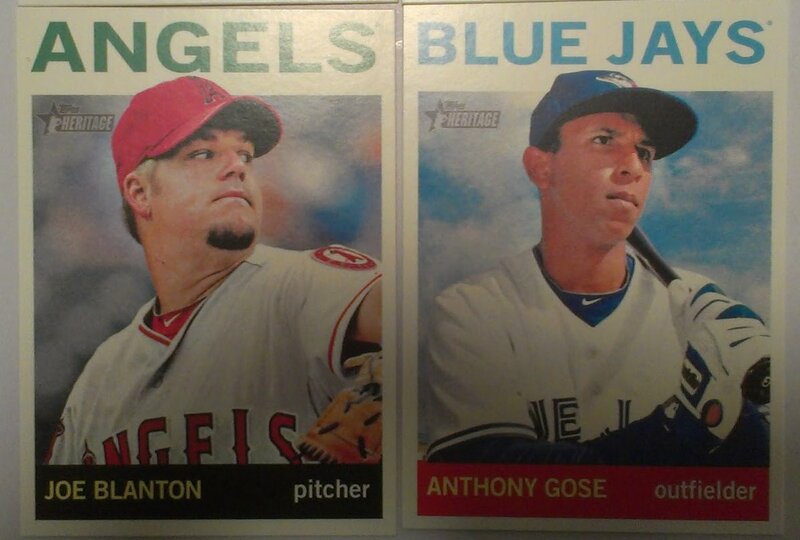 Picked up one of those 2013 Topps Heritage 3 Packs yesterday to see what the parallels look like. Topps has been doing this for a few years now, As far back as 2011 at least. The 3-Packs run $9.49 or $10.06 when you factor in PA Sales Tax. That is a savings of 50 cents over picking up 3 loose packs plus you get the 3 bonus cards. The black border treatment for 2013 is much better then 2012 Heritage, where only the top 2/3 of the card could be black bordered. It just looked awkward. The Black Border 2013 Topps Heritage do echo 1971 Topps. Either I got a bit lucky with my bonus pack or the SPs are not an issue for the black borders, because both Kinsler and Molina are both among the High Numbered shorts. 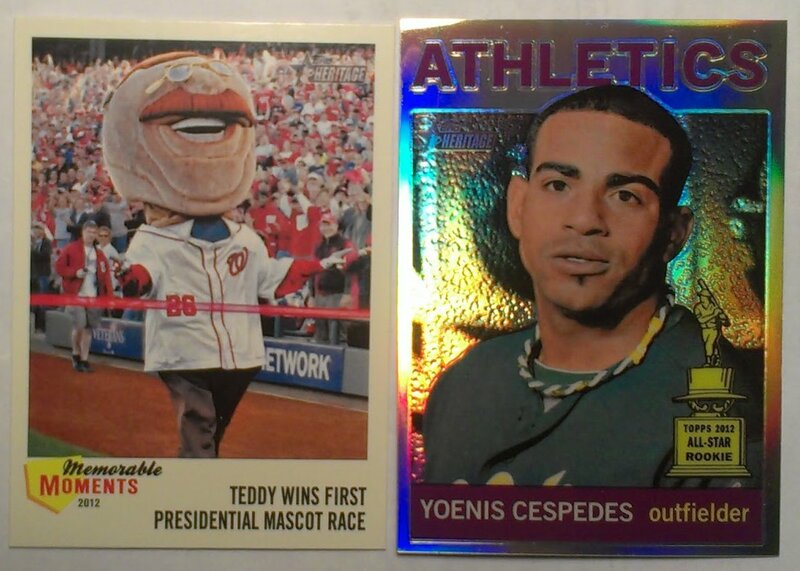 The Teddy card is up for card of the year for me, and I am happy to pack draw him. Not sure that 2012 memorable moments really belong in Heritage. The Cespedes is a Refractor Parallel. My other insert was the Then/Now of Whitey Ford/Felix Hernandez. The Stat was shutouts - although in 1964 Whitey Ford did not lead the league in shutouts - that honor went to Dean Chance. 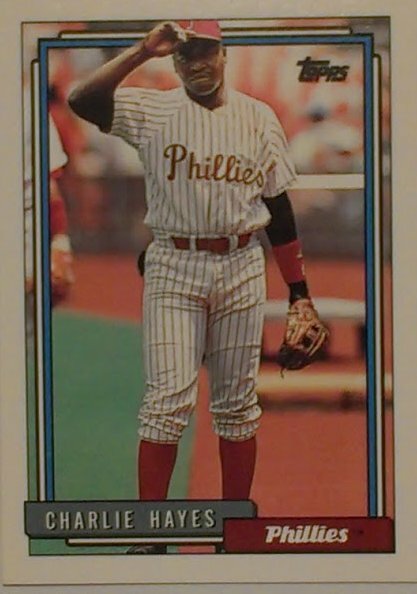 The 24 base cards yielded a grand total of ZERO Phillies cards so team Phungo is still seeking our first 2013 Topps Heritage Phillies card. The other thing we noted is some of the caps look huge when they spill over the border. This to me is the defining characteristic for 1964 Topps. It's a set I didn't love at first put the beyond the border does help the headshot pop a little. Since profile pix are the norm across Heritage it is a design element that works for the retro set. I never expect much from a Nickel Box. Those low expectations actually improve the experience. There are no worries about getting a good deal for a card or its condition. The card is stinking nickle - The only issue it adds to my hoarding habit. 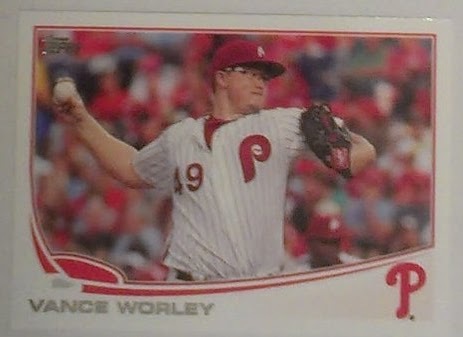 Yes there were 2013 Topps Phillies in the nickle bin, albeit only former Phillies. X-Phil or not, I am a fan of the retro-uni cards. With relatively little effort my 2013 Topps Phillies collectiion is off to a good start. I think I have four of the cards so far, and that is from just one each of a Hanger and single pack and the Worley above. Note: according to the Current Twins Depth Chart, Worley is Minnesota's Opening Day starter. I think the Twinkies may be in for a long year. 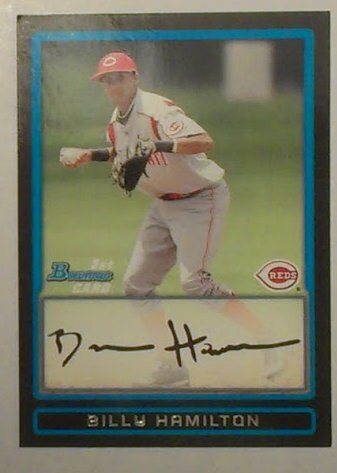 If your a prospector you have likely heard of Billy Hamilton - he stole something like 400 bases last year at various stops in the Reds system. I have seen him ranked 11th among prospects in one of the polls. Speed is always exciting especially with young players. Hamilton will also have the advantage of playing with a pretty good ballclub whne he reachees the major league level. There is a minor dinged corner on the caxrd, but still finding a prospect card in a nickle bin is a thrill. Especially when it appears he is on the verge of making some noise at the major league level. There were also just released Heritage Cards commons in the nickle bin - lots of them. No Current Phillies but a couple of Formers. Note: Again with the Depth Charts - The Angels Depth Chart has Joe Blanton penciled in at #3. Makes it a little tough for me to take them seriously as a contender. There was at least one star in the Heritage nickel bin and on a Hero Number as well. This card shares its number with the 1964 Topps Hank Aaron card. I wonder how many heritage cards had their Heritage number shared between Hank Aaron and Chipper Jones. Dudes didn't play the same postion, but they were definitely the stars of their respective squads. Over the weekend news came down that Freddy Garcia was released from the San Diego Padres, for whom he was trying to get a 5th starter spot. The bullpens at Camden Yards are beyond center field and afford fans a great opportunity to see pitchers up close. If you get there early enough to see batting practice, you will also likely be able to catch the warm ups of the starting pitchers. This pix was taken prior to a game on April 24 2011. Garcia threw six innings of shutout ball that day and would have won the game had it not been for a blown save by Mariano Rivera. 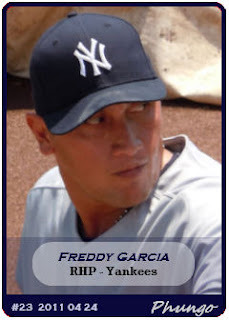 In 2011 Freddy Garcia was a pleasant surprise for the Yankees much of the year, but he was unable to repeat that performance in 2012. As spring training winds down teams will be finalizing their opening day rosters and Garcia may find a spot to continue is career. Based off his poor spring I would think it is unlikely that he gets picked up right now, but he will be out there when a starter somewhere goes down. Garcia has had a solid career, 152 Wins, 1 World Series Championship with the 2005 White Sox. The big exception is his 2007 stint with the Phillies (1-5, 5.90 ERA). Even worse the Phillies traded two prospects for Freddy Garcia - Gavin Floyd AND Gio Gonzalez. Floyd has had mixed success since 2007. Gio Gonzalez is now one of the top opposing pitchers in the Phillies own division with the Stinking Washington Nationals. That's right - for the first time I referred to the Nats as the Stinking Washington Nationals - I have finally admiited the Nats are a major threat for 2013 and forward. The fan voting for the Phillies 2013 Wall of Fame Honoree closed earliar today. There was only one reallly legit candidate on the ballot. There were about a dozen candidates. My 3 votes went to Jim Konstanty, Harry Wright and Pinky Whitney. Other candidates included Rick Wise, Von Hayes, LC, Fregosi, Ozark, Gregg Gross, and Ron Reed. I suppose at some point he would get my Phillies WoF vote, but not just yet. If the fans vote him in for 2013 thats fine with me - I am off the hook. I do think that he will end up winning the 2013 fan ballot. The rest of the candidates are too thin and spread across such varied eras that I don't think any of them could muster more votes then Schill. This leads me to a question. Who in the Phillies family will induct Schilling into the Phillies WoF? I just don't seem him as being that close with any of the Phils alums. Past inductees were introduced by folks that made some sort of sense. In 2012 Mike Lieberthal was inducted by fellow Phils WoF catcher Bob Boone. Darren Daulton was introduced by Steve Carlton which surprised me but apparently the two were known to have an adult bevarage together. There are other 1993 Phils already on the Wall including Dautlon and John Kruk. But I always saw them as being from the other end of Macho row. Kruk and Schilling are both colleagues with ESPN and perhaps the two of them have a better professional relationship then I imagine. Of course none of this may matter - Maybe Curt Schilling would blow off the honor. Maybe Curt Schilling is too big for Philadelphia, just like he was back in the 2000 season. I concede this is a crap photo - damn you Valley Forge Convention Center basement and your shoddy lighting. I wanted a Schilling card in one of the Phungo sets and this was just barely good enough to make the grade. Team Phungo spent this past weekend in New York City. 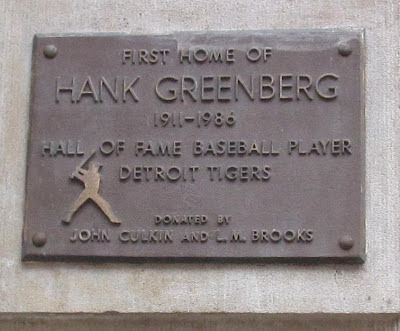 We stayed in the West Village section which I found out was the birthplace of Hall of Famer Hank Greenberg. 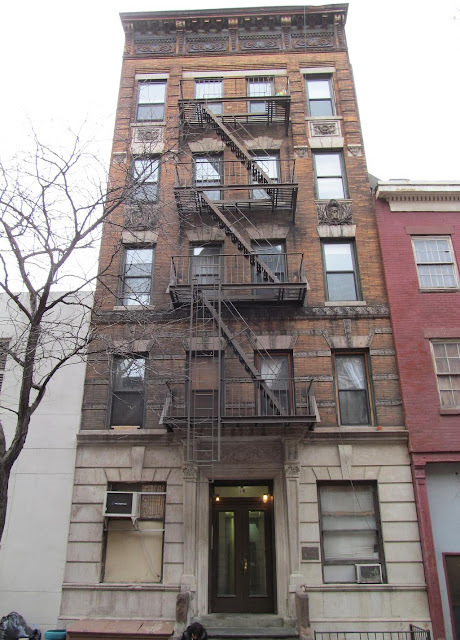 Hank Greenberg was born at 16 Barrow Street in Greenwich Village on New Years Day in 1911. My limited research found that he lived there till he was 7ish. I have never looked for a players childhood home or gravesite before. There isn't really much gained by the endeavor in this case. The building appears to currently be an apartment building. It is in a sort of old residential street - There are several row homes on the other side of the street which also include a tavern and a few other shops. 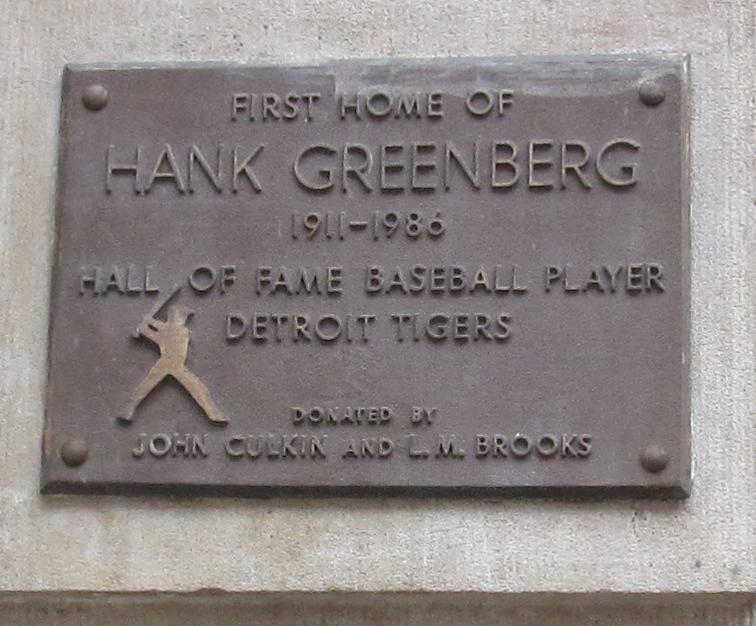 Beyond the marker presented above there isn't anything else noting the location or Hank Greenberg's accomplishments. This is the home photographed from across the street. The house was easy to find, it is in the West Village between Bleeker and 4th streets - Bleeker is a pretty significant street in the village. There is a subway stop on 4th street near Sheridan Square park, which is about 2 blocks from the Greenberg house. Even with all these great baseball accomplishments Hank Greenberg is likely best known for being one of the first great Jewish athletes. His story is told in the film in the documentry The Life and Times of Hank Greenberg. People may claim that you can find anything on the internet. Well I can dispute this. The Greenberg Birthplace Plague gives little information about it's history. It wasn't placed by New York State or City or the Baseball Hall of Fame or any other organization near as I can tell. There are two names noted as Doners on the plague on the plague, John Culkin and L M Brooks. There is a Dr John M Culkin who taught at Harvard and appears to be a bit of a baseball fan, but I could not totally connect him to the marker. LM Brooks proved to be to vague a name to research. 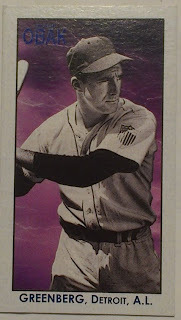 There are not a lot of Hank Greenberg retro cards floating around out there. Tristar has a few cards of him in their Obak line including the 2010 Mini above. There are no recent finished auctions for this card, among other Minis from 2010 Obak that were sold the prices ranged from 64 cents (Starlin Castro) to $5 for Ray Chapman. There were several NSCC exclusive minis that went for significantly higher prices - especially Mike Trout, but I really don't consider those cards part of the 2010 Obak set. Chase Utley is in the lineup sporting the Phillies St Pats Day Green Uni - similar to the one he is wearing on his 2007 UD card. Ok I realize that I am the only person that cares about the WBC - just deal with me for a posting. I do understand there is a great element of baseball light - all the rules for pitch counts and pitching dates. And there are all the adverse affects for the MLB teams that are sending teams to the WBC. I like seeing players w/ different unis and teammates. I enjoy the spirit of the World Baseball Classic and it is cool to see a baseball event in March that isn't totally meaningless. I get the meh reaction by most fans, but I would like to see more fans become interested in the event - and I will blather on about it occasionally. Here are some Phungo Cards from when Team Phungo checked out the WBC qualifer in San Juan. Bernie was retired from MLB for three years when the 2009 WBC rolled around. He came out of retirement to represent Puerto Rico and he even threw out the first pitch prior to one of the games we attended. This is one of the things I like about the event - it is an opportunity to bring back some players from the recent past. As far as I know this hasn't really occurred in 2013 - Johnny Damon represented Thailand in the Fall Qualifiers but that doesn't really count. Bobby Abreu and Jim Thome would be great guys to send out for the WBC. Minor leaguers also can get mixed in as well. There really isn't a critical need for all the Major League stars to get involved. It only happens once every four years. If an all-star caliber player can represent his country once in his career it is a great opportunity. The WBC does use a DH, but David Ortiz had to bring his glove and play first in 2009. This is because the Dominican squad was LOADED at shortstop. I think they had Jose Reyes, Hanley Ramirez, and Miguel Tejada all manning the position. We ended up seeing the rare game where Big Papi played in the field and Reyes was a DH. I never really mentioned this, but several Phungo Cards end up on the cutting room floor. Sidney Ponson was one of those cards. He is to much of a jerk, and really lacks any hipness - I just couldn't give him a card despite having a fairly decent close up. Card #37 in 2010 was awarded to a combo card of Juan Pierre and Jeff Kent. I will likely have a few more WBC ramblings over the next couple of weeks - just a warning. 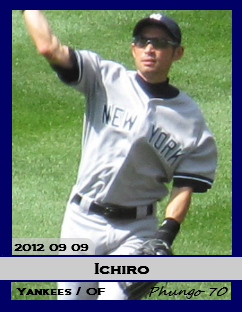 It came up recently over at Twitter that Topps hasn't put out a 2013 Ichiro Card. Well they are just slackers! Last year we took a baseball excursion out to Seattle and I took about 2 dozen pix of Ichiro. Of course he gets traded before I got a chance to put him on a Mariners card. Fortunately the Yankees come to Baltimore 10 times a year so I was able to catch the likely HoF there. Good Shot - little bit washed out on a sunny day when the Bronx Bombers scored about 20 runs. I would have liked to get the ball in the pix, but if I would have framed it that way Ichiro would have been pretty tiny. Get with it Topps - Phungo has a 2013 Ichiro card - why not you? In many ways this is a perfectly fine card. And no, I don't have anything against Josh Reddick or the Oakland A's. To be honest this is a great photo of one of baseball's young stars. So what makes this card a junk of the month winner? Topps annoying variation card system. 2013 Topps includes a stealth insert of "Out of Bounds" Variations. This is a 25 card subset featuring pix of players making catches along the walls of the stadiums. This is all fine, and the above Reddick cards appears as if it could be one of these cards. This is Reddick's base card! To check which cards are variations and which are the OOB variations one has to check a serial number on rear of the card. The variations have a serial # that ends in 3020 while the base end in 2820. That is where my issue with all the goofiness in recent Topps. The player on the front of the card should matter more then some dopey serial number on the back of the card. Today we look at a Set that Topps released in 1964, but wasn't issued with the base set. 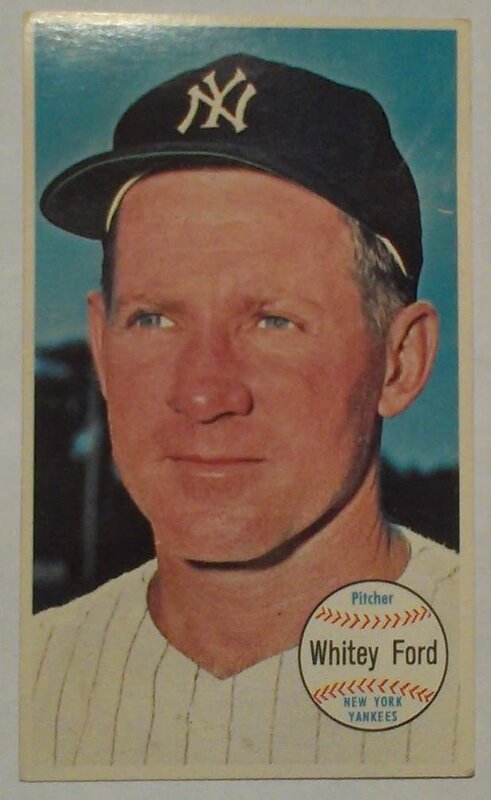 The 1964 Topps Giants set was a near postcard sized issue of 60 cards. I really like this design simple uncluttered. I would like to see Topps bring this format back for the smaller traditional sized cards, just to see what it would like. Either Archives or Lineage including these cards as box toppers a few years ago, but I haven't picked any up yet. I would hope that 2013 Heritage would do the same thing this year, but I have not seen any indication that there are plans for including the larger format cards. I really like the flip side of these cards. I have always been a fan of the newsprint format on cards. Having the 2nd photo on the cards is also a nice bonus. The late Chris Stufflestreet wrote a fine column on this set in 2011 which you can find here. For all of the card blogs I have read, I have not see many folks talk about Whitey Ford, which is a bit odd. He is a Yankee and a Hall of Famer who was on Six World Championship teams. .
Ford won 236 games in the majors, leading the league 3 times. One of those seasons was 1961 when He went 25-4 and won the Cy Young Award. He had an additional 10 World Series victories - over 146 World Series innings he compiled a tidy ERA of 2.71. 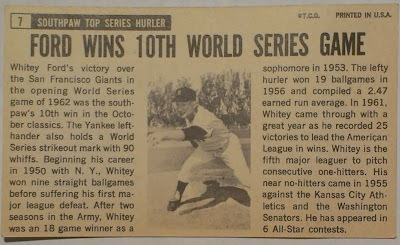 Whitey Ford was also a 10 time all-star. Great all-around numbers and the guy lost 2 years to military service as well. He was elected to the Hall of Fame in 1974 on his second ballot. Today Whitey Ford is still alive at age 84. He worked the Philly Show within the last couple of years. The Phillies Room has a posting on the 1964 Topps Phillies as part of the ongoing Topps Phillies Series. The PhillyShow returs to Valley Forge this weekend. Team Phungo is a bit under the weather so I am not sure I will be attending. Game time decision for Saturday. Tix for the show are $8. Some local papers have a $1 off coupon in the Friday Sports sections. Among the autograph guests this weekend are HoF and Politician Jim Bunning, Steve Bedrosian, Charlie Hayes, Eagles RB Brian Westbrook, Ravens and Rutgers RB and recent SuperBowl Champ Ray Rice and Wrestler Ric Flair. On Saturday Sixers Alum and ambassador Darryl "Chocolate Thunder" Dawkins is scheduled for complimentry autographs. For a synopsis of the PhillyShow in December click here. The Phungo Card Show info Post is here.